After an annoying delay, the much-hyped multiplayer shooter Evolve is nearly upon us. Which leads to a more immediate question for all us PC gamers: will we be able to run the thing? Well, the game's developer released its official specs today. And while they're sorta steep, they're certainly not insurmountable. HOW MUCH CAN WE TWEAK THE SETTINGS? WHAT ABOUT 4K RESOLUTIONS AND SLI SUPPORT? The game supports 4k resolutions right now. HOWEVER, there is no support for SLI out of the box. 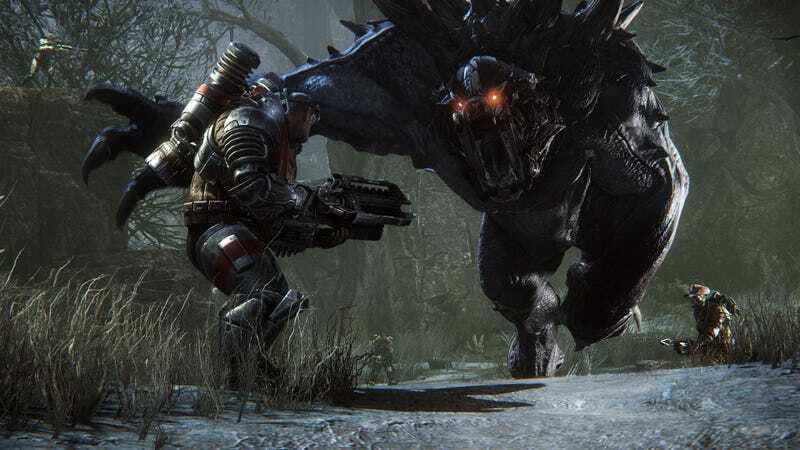 Our teams are working on that and hope to get SLI support into Evolve as soon as possible. As soon as we have more info to share here, we will! As far as PC specs go, Evolves seem like standard fare compared to other big first-person shooters to come out for PC in recent months—Wolfenstein: The New Order, Call of Duty: Advanced Warfare, Far Cry 4, and so forth. Some gamers on Reddit highlighted the fact that the game recommends an Intel i7 core for a central processing unit (CPU). But that's still a relatively old Intel model. In other words: judging by the info from Turtle Rock, PC gamers who already have their rigs up to snuff shouldn't have a problem with the game. By saying that, however, I don't mean to rule out any contingencies that might lead to problems with the game's performance on PC. The quality of PC ports is, sadly, often an open question. Far Cry 4 was a particularly frustrating recent example, given how many problems players experienced on that platform. Let's hope that Turtle Rock handles its PC port as well as Borderlands 2, another 2K-published shooter, did back in 2012.